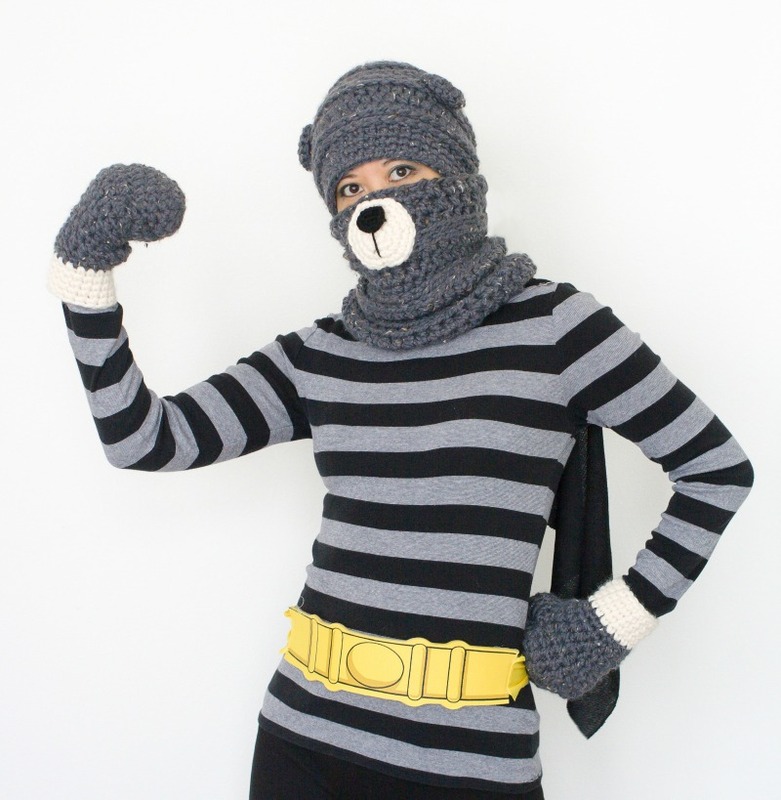 If you’ve seen my #yarnheroes Mama Bear outfit, you’ll see that I’m wearing a hat, a cowl and sporting some chunky mittens. I’ve shared the Millbrook Slouch Hat pattern as my simple charity pattern for Lion Brand’s Yarn Heroes campaign, and now here is the pattern for the Millbrook Chunky Mittens! 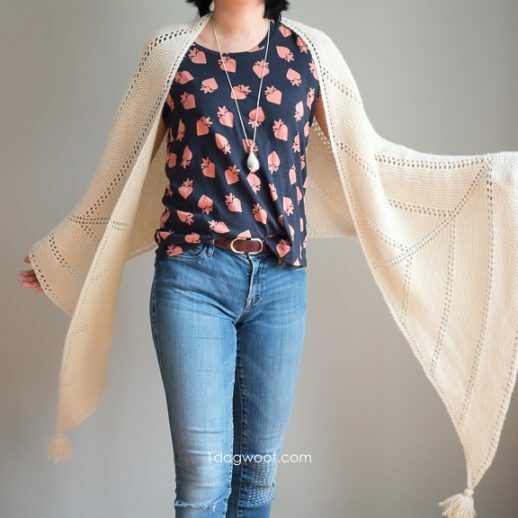 For all the pieces in the Millbrook winter set, I used Lion Brand Wool Ease Thick & Quick. 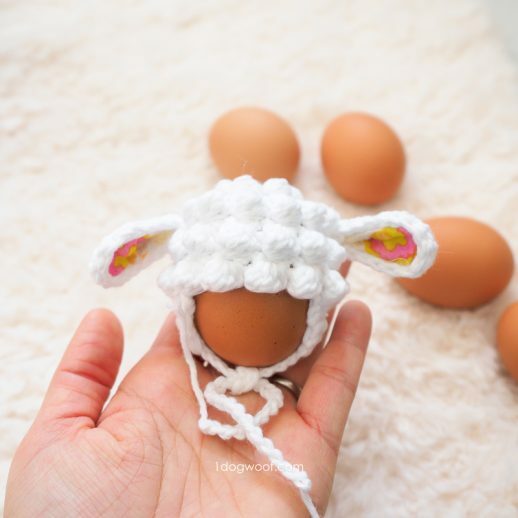 The yarn is soft and chunky and works up so quickly on these small projects! 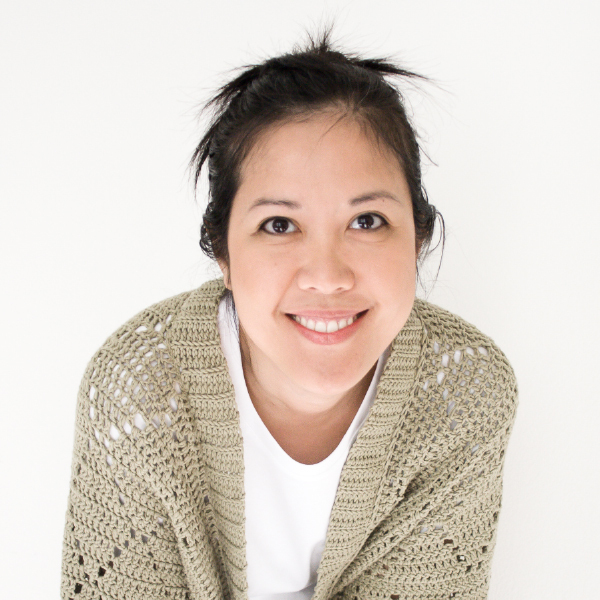 I chose to use the Graphite color because I didn’t want to be a brown bear or a polar bear – silly maybe, but I love the specks of brown and taupe in the Graphite yarn that gives it an extra depth and richness of color. The yarn recommends pairing with an N crochet hook, but I decided to go down a couple of sizes and used a J hook instead. This makes everything a bit more squishy and extra warm! I’ve never actually made mittens before, only a set of foxy handwarmers, so the pattern is fairly basic, since I wanted the whole Millbrook set to be simple and quick to work up. These mittens consist of a tube, cut in half so the top folds away, and holes for my thumbs. To dress it up a bit, I added a simple color blocked border of single crochet stitches that matches the border of the slouch hat. I worked in seamed rounds, and used the no-cut join to join my rounds. 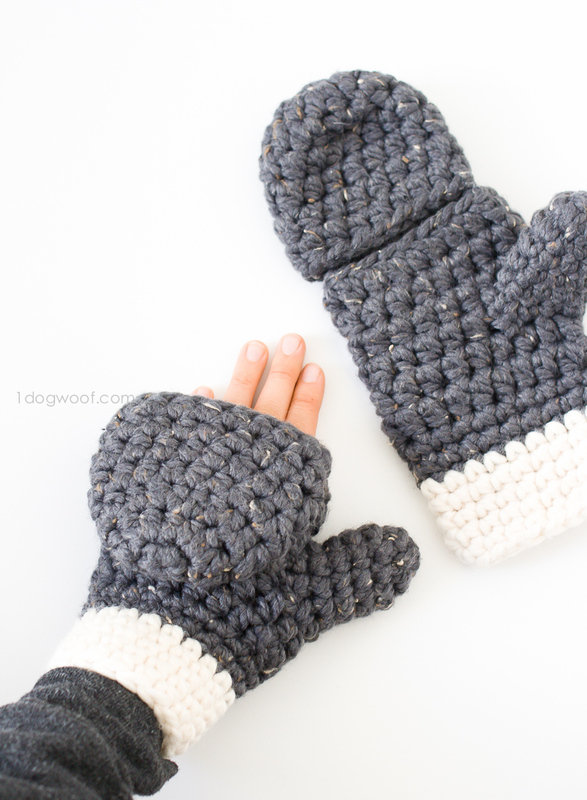 This created a bit of a bump at the seam on the inside of the mitten, but I found that to be a better alternative than having a seam that twists on the outside. 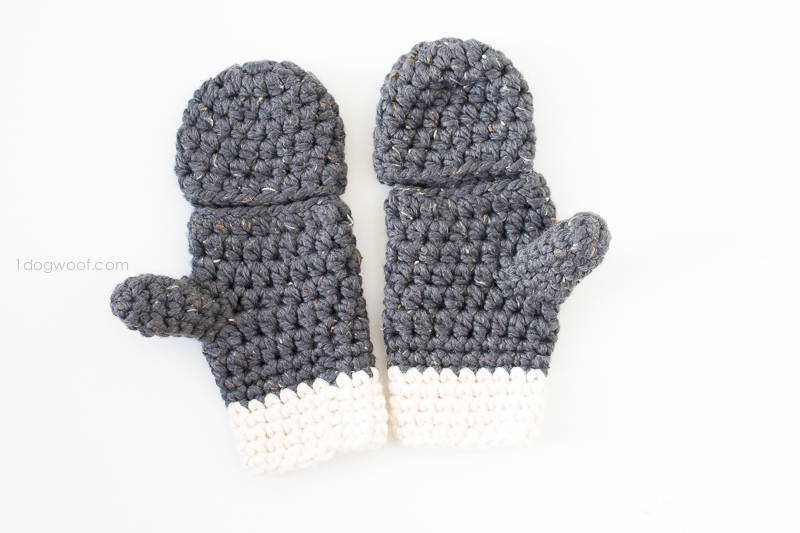 The choice is yours though – if the inside bump bothers you when wearing the mittens, you can always try a normal join. Let me know if you give that a try! 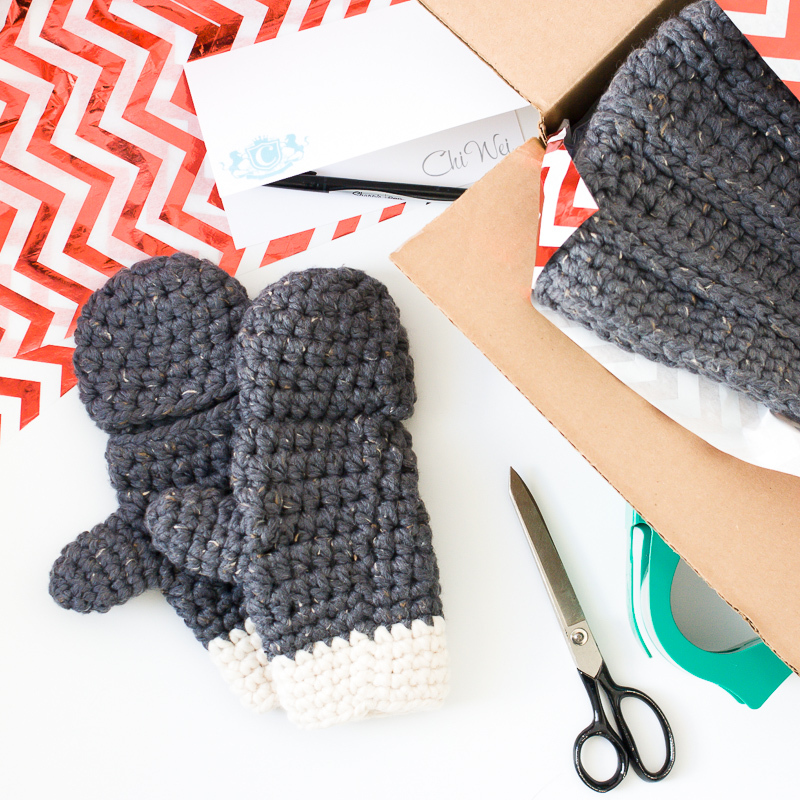 These mittens, along with the hat and the cowl, are headed up to Oregon to be donated to The Gracie Project. 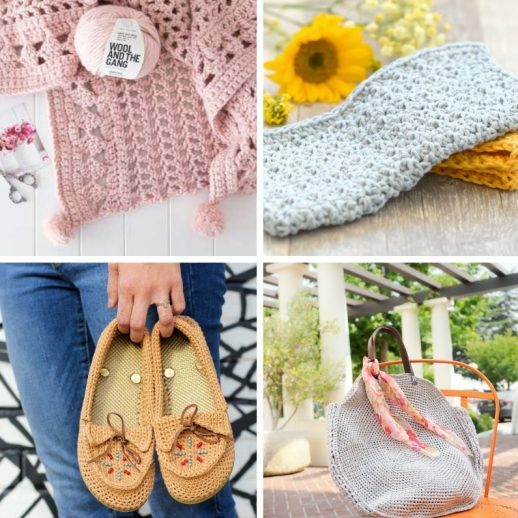 Jessica, from The Hook Nook, is helping to collect handmade hats and accessories to give out to children at local children’s hospitals in honor of Gracie, who has successfully fought off that ugly thing we call cancer. Right now, you can use the code YARNHEROES2016 on Lion Brand’s website to get $5 off any purchase of $20 or more, and the offer is valid until December 15, 2016. OR, head on over to Instagram or my Facebook page to see how you can win 4 skeins of Wool Ease Thick & Quick! Lion Brand will send 2 of my readers enough yarn to make the Millbrook winter set and be a yarn hero to someone in their community! The ch 2 (and ch 1) at the beginning of each row does not count as a stitch. Work first stitch into the same stitch as the join. Use the No-cut join method to join each round. Using a size J hook on this bulky yarn creates a tight gauge. This patterns makes one size mittens. 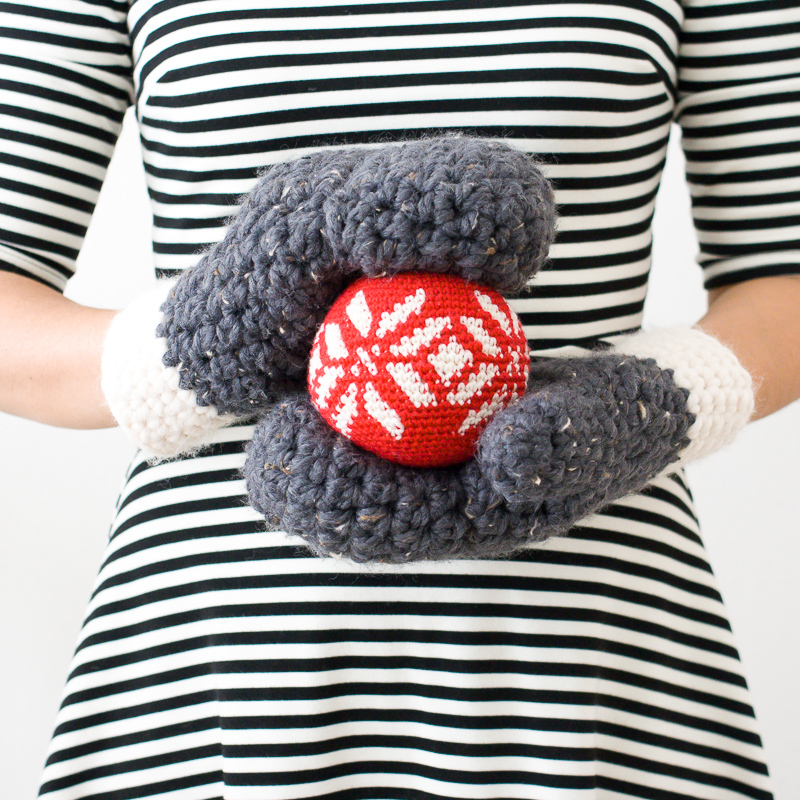 Any changes in yarn thickness or hook size will change the size of the mittens. Round 15-16: Ch 2. Work 1 sc in each st around. Join to first sc with sl st. (18) Switch to Fishermen. Cut the yarn, leaving a 6 in tail, and pull through the last stitch. Weave the tail through the front loops of each of the 6 st around. Pull tight, fasten off, weave in ends. Weave in all leftover ends. I chose not to sew a button onto the back of my mitten to hold back the flap, but that option is completely up to you. 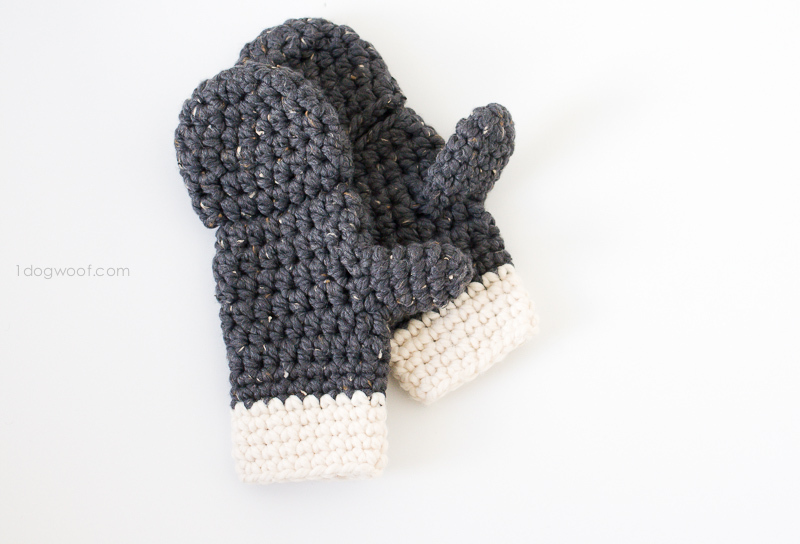 If you wanted to make a fully closed mitten, I think you can probably skip Round 8 on both the left and right mittens and just continue to work half double crochets in the round. 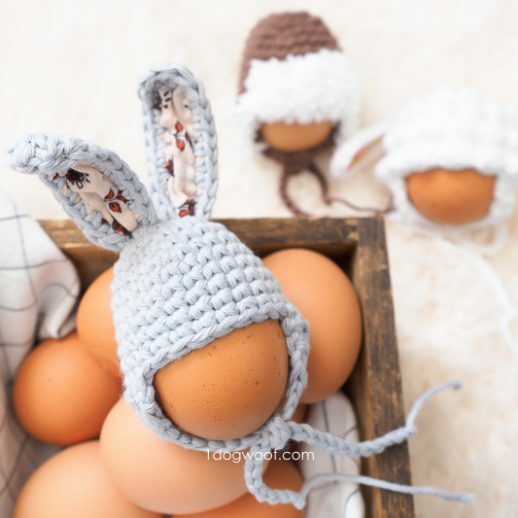 These are so great and the pattern was so easy to follow! My seam went diagonal so I had to improvise for my thumb hole but the way you wrote the patterns made it easy to do 😊 Thank you! Could I just do the left and right mittents the same?? I have the left one finished! To make this for an 7 year old would you start with 4 instead of six for the majic ring? Great pattern and easy to follow, I did find it came out rather small though. More for a toddler hand than my own adult sized palm. What would i do to make this larger? I successfully crocheted the left mitt, following your lovely pattern and I’m really pleased with my first attempt at including a ‘thumb’. I am now trying the right mitt, but I am having a problem with the position of the thumb. Following the pattern (as I understand it) I am getting the thumb hole on the back of the hand, rather than in the same side as the opening for the finger cover. Have you any idea where I’m going wrong and how I could put it right. I’m eager to finish them so that my partner can wear them in the freezing weather we’re experiencing at the moment. Many thanks! J’adore votre modèle, mais mon traducteur n’est pas du tout adapté aux tutoriels de crochet… et je ne comprends donc rien de ses explications ! Auriez-vous possibilité de traduire ce tutoriel en français ? Good pattern but Row 12, Right Hand should be 6 hdc, 3 chains, skip 3 chains, 9 hdc (opposite if the left glove) I ripped this out multiple times until I realized the mistake in the pattern now it fits correctly. 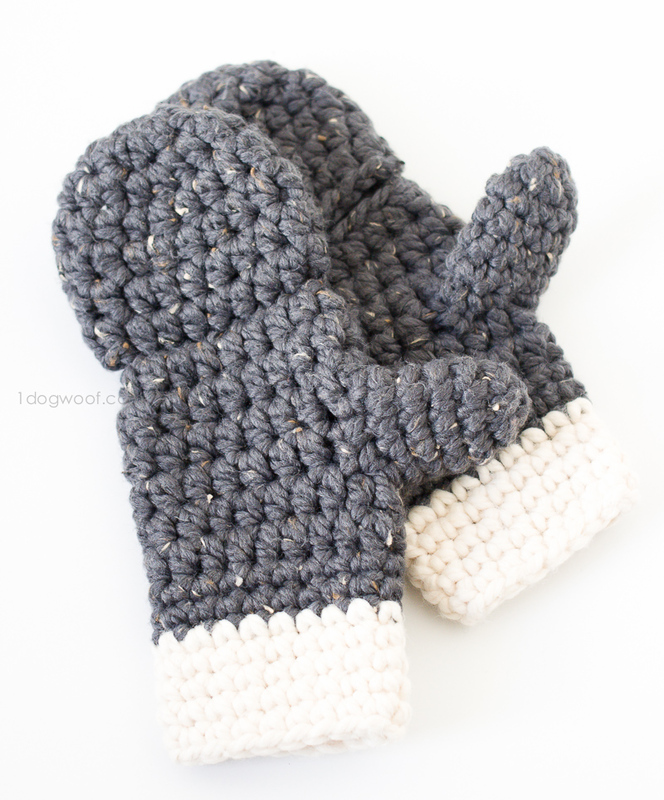 I am trying to figure out how to make your mittens to match a hooded scarf using worsted weight (4) Caron one pounder. And an I hook. Do you have any suggestions for the adjustments I need to make.